The sixth-largest city in Texas, El Paso is far from the dusty border town portrayed in Wild Western folklore. Located where Texas, New Mexico and Mexico meet, this city is the center of about $20 billion in trade activity each year between Mexico and the United States. 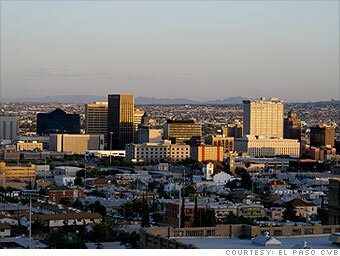 El Paso is a crowded and busy metropolis that, to the eye, seems to mesh right into its Mexican neighbor, Juarez. The reasonable cost of living, affordable real estate and predominantly blue-collar workforce make the city a cheap place to start a business, despite high property taxes, locals say. Only the border wall and the Rio Grande separate El Paso from Juarez, and the cities benefit mutually from each other's residents. Local retailers and the entertainment and arts scene flourish on weekends, when shoppers from Mexico flood El Paso on day trips. Being bilingual in both English and Spanish is an asset for local business owners. Locals enjoy a warm, sunny climate and thriving Latino culinary and arts scene. What do you think of El Paso?